The airport is located in the middle of Greater Phoenix, less than ten minutes from downtown, and within 20 miles of almost all of the towns and cities. With 1,200 daily flights—about 500 of them nonstop, PHX is one of the most convenient airports in the United States. But at the same time, it is one of the busiest airports in the United States. 2 In 2017, PHX served 43,921,670 passengers, making it the thirty-fourth busiest airport in the world. 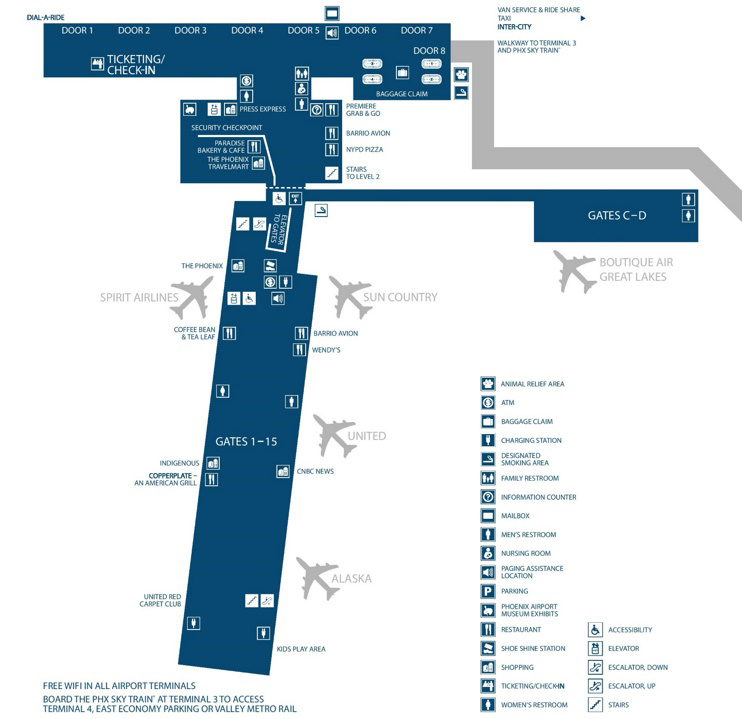 3 The airport has 116 aircraft gates in three Terminals (2, 3, and 4). 4 The airport is adorned with 326-foot tall air traffic control tower and is among the tallest control towers in North America. Known as the “Valley of the Sun,” Phoenix is the largest city in the Southwest and is a large, busy metropolitan area. Serving more than 40 million people in a year, no doubt PHX airport remains crowded most of the time. And if you are traveling in summers, there will be a sure-shot increase in your anxiety level because of the dry heat outside. Stand out from the crowd by choosing a private, non-stop service of RapidShuttle 247 to and from PHX airport at most affordable price ever. You can just relax or finish up your projects and never have to worry about driving or hiked prices. Budget friendly, convenient Shuttle Services: When your flight lands, sometimes Phoenix Airport can be extremely busy and you might not wish to be standing on line or outside in the heat waiting for a taxi to show up. With RapidShuttle 247, you can make a pre-booking at an affordable price and the driver will be eagerly waiting for your arrival. Where to park your vehicle? If you decide to take your car and park it the airport parking lot, think wisely as most of the parking in PHX airport remains occupied most of the time. Moreover, the burden to carry the entire heavy luggage all the way to the terminal, struggling against the heat waves is another challenge. So, be smart and call RapidShuttle 247 for a safe, reliable and efficient transportation experience. Experienced and Professional: With more than 20 years of experience in the transportation industry, RapidShuttle 247 strives to exceed all the expectations of the customers by providing them private, cost-effective, professional and courteous transportation services. Head to the crosswalk from door number 8 near the rental car shuttles and to the right. Please contact our PHX Airport dispatch at +1 (888) 672-7438 and select option 2 or +1 (949) 667-2743 for further assistance. The PHX Airport dispatch will direct you to your RapidShuttle vehicle. Head to door number 6. Head north to door number 5.